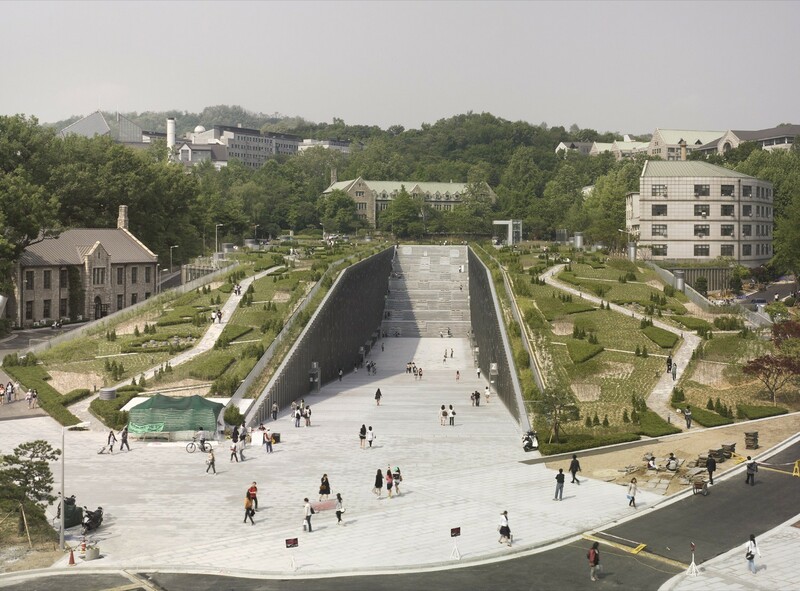 Ewha Campus Complex’ (ECC) is the 4-storey underground building which is considered the largest underground in Korea. The building is regarded as a study –entertainment center including a large library, IT center, bookstore, gym, and even cinema, theater arts, numerous cafes with other cultural facilities in the floor below, along with classrooms, lecture halls and ecological park at the top. 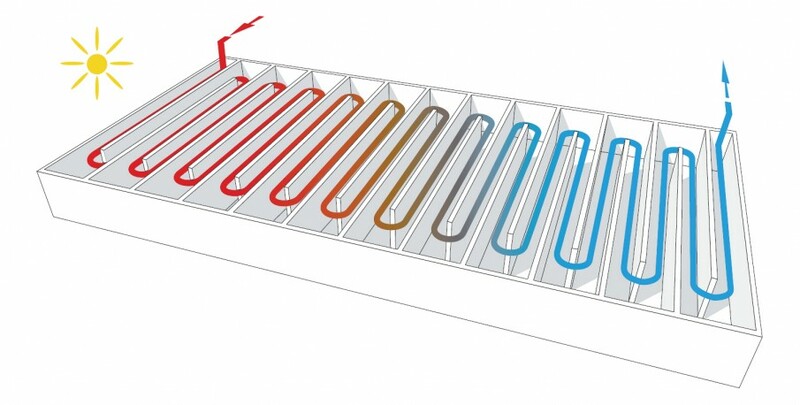 It uses 4 types of eco friendly heating and cooling system that is Thermal Labyrinth, Con’c Core Activation, Cooling Heating Radiatior and Goethermal Energy. Also roof top garden and enormous curtain wall also helps so reducing energy waste. 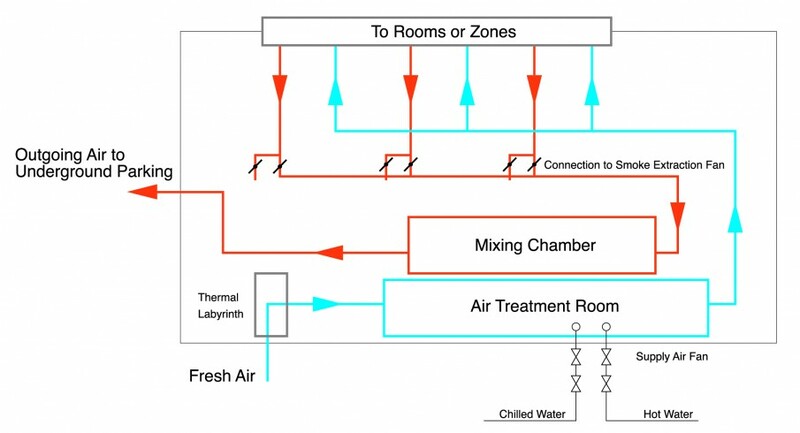 Every system connected to each other system but the main system that contribute the most to the building is Thermal Labyrinth system. Ventilation is essential to maintaining a healthy indoor environment. However, during the summer and winter seasons, the temperature of the outdoor air can be so extreme that providing adequate ventilation requires a significant amount of energy. Consequently, an energy-efficient ventilation system is important for minimizing energy consumption. The thermal labyrinth is a ventilation system that pulls in outdoor air through an underground labyrinth-shaped concrete structure that is part of the building itself. Through heat exchange with the ground, this system can pre-cool and pre-heat the outdoor air in the summer and winter seasons, respectively. 1.4 meters of cavity between retaining wall and building back wall is utilized for thermal labyrinth. As this cavity was formed from structural reason, no additional cost was occurred for this thermal labyrinth. Rather, saving was possible because of reduced size of chillers and boilers. And additional saving was obtained from pre-heating and pre-cooling of the air. These benefits will be remarkably higher than the increased electric energy cost due to the additional air resistance in the thermal labyrinth. By using the TLVS, the peak loads for the cooling and dehumidification and the heating and humidification of the outdoor air were found to be reduced by 47.6% and 41.2%, respectively. The annual energy need for conditioning outdoor air was reduced by 31.3%, and a payback period of 12.1 years was calculated. Reduced capacity: The whole building concrete is used as energy storage. Therefore the required energy is supplied continuously over 24 hours. That means there is no thermal peak in this system. Thus the optimum equipment sizing was possible. Also the operation cost for energy circulation was lowered. The concrete core activation is also used for heating. For this application, the main goal is protect the building from cooling out. As the surface temperatures were maintained between 18 and 22 °C, the building provided a higher level of thermal comfort. Easy use of natural energy: Because of the high water temperatures cooling (17 / 20 °C), natural heat sources such as groundwater and soil energy can be used.